Brilliant, reminiscent of Lewis Hyde’s The Gift in its reach and of Timothy Egan’s The Worst Hard Time in its haunting evocation of human lives, offers a sweeping view of a surprisingly revealing aspect of human history—from the stone lamps of the Pleistocene to the LEDs embedded in fabrics of the future. Brox plumbs the class implications of light—who had it, who didn’t—through the many centuries when crude lamps and tallow candles constricted waking hours. She convincingly portrays the hell-bent pursuit of whale oil as the first time the human desire for light thrust us toward an environmental tipping point. Only decades later, gas street lights opened up the evening hours to leisure, which changed the ways we live and sleep and the world’s ecosystems. Edison’s “tiny strip of paper that a breath would blow away” produced a light that seemed to its users all but divorced from human effort or cost. And yet, as Brox’s informative and hair-raising portrait of our current grid system shows, the cost is ever with us. Brilliant is infused with human voices, startling insights, and—only a few years before it becomes illegal to sell most incandescent light bulbs in the United States—timely questions about how our future lives will be shaped by light. 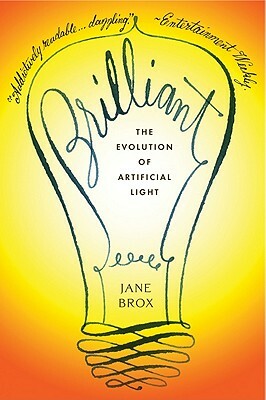 "Just one of the many pleasures of Jane Brox's sweeping history of human light is its evocation of the wonder and fascination the lowly light bulb roused when it was new, before it became, by virtue of the reverse alchemy of mass production, abundant and déclassé. Brox succeeds brilliantly thanks to writing that rivals her subject in sparkle, glow, and wattage." "Brilliant is fascinating in its subject matter, charming in its storytelling and accessible style, and meticulously researched. This kind of book helps place science in a human context."